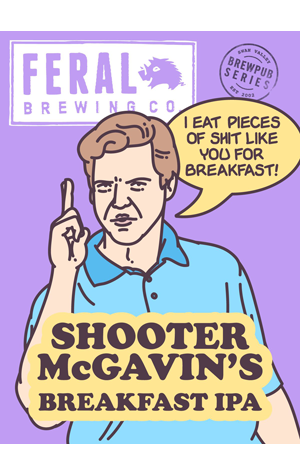 Despite selling out at every GABS session, meaning many attendees didn't get to taste it, Shooter McGavin’s Breakfast IPA from Feral still managed to place second in the People Choice. Perhaps it’s this fervour that called for a revisit, as the fruity NEIPA is now hitting taps around WA. In some coughs loudly out of the box thinking, the Feral team has literally put breakfast into a beer style most associated with breakfast juice, describing mash inclusions as having, “grains of nutra, flakes of corn, bix of weet, bubbles of rice and bran of all” – plus some lactose for good measure. The result is thick. Really thick. Mango shows with some grapefruity citrus playing a supporting role, however there's no acutely defined flavour – the effect is more a tropical fruity pulp. Accordingly, Shooter McGavin’s leans towards the sweet, with the low bitterness, chalky finish presenting some actual cereal sediment in the glass. Like actual breakfast cereal.